The Swedish firm Aimpoint, originator and a world leader in red dot sighting technology, is now introducing their new line of red dot sights, the Aimpoint® ACRO™ (Advanced Compact Reflex Optic) Series. 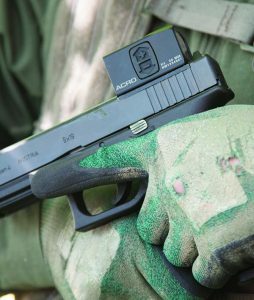 The unique small sight design of the ACRO series electronic red-dot sight was developed for use on pistols, as shown here mounted on a Glock, and other firearm platforms. For many years, the company says, end users have requested a small enclosed red dot sight to fit on handguns. Utilizing Aimpoint’s advanced sight technology, Aimpoint is proud to launch the first of its kind to the market. The Acro P-1, offers an enclosed system that is much more durable than those with open systems. It is also the only sight in its size category fully tested for shock, vibration, temperature span and other environmental stress. The Acro P-1 optic can perform under tough conditions while adding negligible size and weight to the equipment. 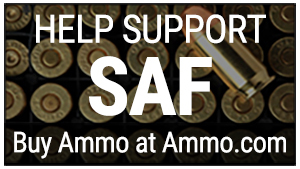 Tested with a minimum of 20,000 rounds on a .40 cal. pistol slide, this small optic has proven itself in its size category as the leader in ruggedness and reliability. Designed for direct integration onto pistol slides, the Aimpoint Acro P-1 sight can also be used as a backup sight for magnifying scopes, personal defense weapons, and on any system where a small red dot is applicable. The Acro P-1 sight is a 1X (non-magnifying) parallax-free optic that features a 3.5 minute of angle (MOA) red dot for fast target acquisition. It is fully submersible to 25 meters and allows continuous operation for over 1 year on a single CR1225 battery. Dot intensity is adjusted with side push buttons. For more information on Aimpoint Acro or other Aimpoint products, visit their webpage at aimpoint.com. Sturm, Ruger has introduced two new rifle model configurations: the Ruger® Scout Rifle chambered for the .450 Bushmaster (shown), and the Ruger 77/17® chambered in .17 WSM. According to the manufacturer, a frequent request from hunters is the Scout Rifle chambered in .450 Bushmaster. That rifle features a stainless steel finish and a lightweight synthetic stock, protected blade front sight and adjustable rear sight, plus a Hybrid muzzle break. Combining the versatility of the Scout Rifle with the powerful knockdown capability of the .450 Bushmaster cartridge, this new rifle delivers the accuracy and reliability customers have come to appreciate and expect from Ruger® rifles. MSRP is $1199. Following on the heels of the successful reintroduction of the 77-Series bolt-action rifles, Ruger is now also introducing the 77/17 chambered in .17 WSM with a 20-inch blued alloy steel barrel and American walnut stock. Flat shooting and superbly accurate, this rifle also features an improved trigger pull over previous 77/17 WSM models. MSRP $999. “These two additions to proven Ruger platforms will benefit a wide variety of shooters,” said Ruger president and CEO Chris Killoy.””Both rifles are examples of how we at Ruger listen to our customers and work hard to deliver on their requests.” For more information, visit your favorite Ruger retailer, or check online at: ruger.com. Padlocks have long been used to secure valuable items, but remembering the combination or where the key is can be a hassle. Fingerprints have replaced passwords for electronic devices and are now replacing combinations and keys. The Tapplock One is the world’s first smart fingerprint padlock. It can unlock in 0.8 seconds with no effort compared to a traditional combination lock that can take up to 15 seconds, or several minutes if the combination is forgotten, to open. The rugged Tapplock One is crafted from Zamak 3 zinc alloy metal and features a cut-resistant 7mm reinforced stainless steel shackle, strengthened by double-layered lock design with anti-shim and anti-pry technologies. The smart padlock is rated IP66, meaning it is water resistant when the lock is closed and is fully functional between 14 and 140 degrees Fahrenheit, which is perfect for locking up gates, sheds, boat lockers and bikes. It can be programmed to respond to as many as 500 fingerprints. Tapplock one’s battery lasts up to a year off a single two-hour charge, which equates to around 3,000 unlocks per charge and users can check the remaining power using the Tapplock app. Tapplock One comes in three colors sterling silver, gun metal and midnight black and is priced at $99.00 for a single lock and bundles are available starting at $179 for two. The smart padlock is available for purchase online from tapplock.com and at selected tool specialty shops.